I woke up this morning having had a really interesting spot of dream logic where my mind was trying to suss out how I'd like to run a RuneQuest game, despite knowing remarkably little about the Glorantha setting. 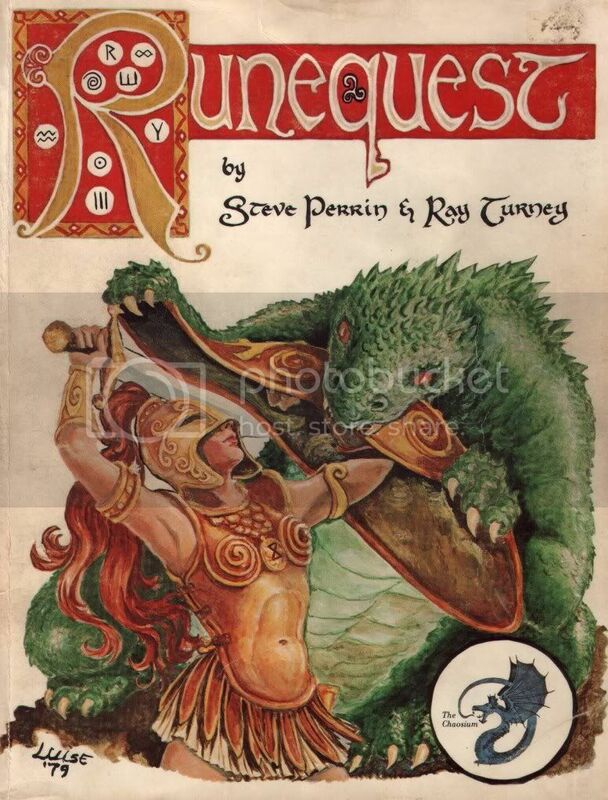 RuneQuest is, like Traveller, one of those games that I didn't play back in the day (sure, I played Call of Cthulhu, based on the same BRP system, but everything about it is completely different) but that I've gotten into in my old age. I'll admit that my exposure to RQ rules didn't come from any actual RQ materials, but the recent Legend release by Mongoose (I'm not sure how all this happened, but I'm assuming that Mongoose lost the RQII license) which you can still get on OBS for the low, low price of $1; that's when I released that RQ is CoC is BRP is all the same and how much it was an extension and extrapolation of earlier D&D rules and how much the Warhammer FRP rules were a reaction to and extension of the RQ rules. Growing up, I had skipped the middle man and gone straight from D&D to WHFRP, but now, I've been paying attention to a vital middle ground between the two that I find personally very inspiring and, unfortunately, one that has been largely ignored by modern gamers. Including me. And so, when I was in my fitful waking up this morning, I was sorting out just how I'd want to run RQII. I recently bought a copy of the RQII rules and RQ Vikings from +Jack Shear who was selling off some treasures over on G+. Mind you, Mr. Shear was also pretty important in the development in my interest in RQ, especially with his glowing reviews a few months back of the King of Dragon Pass video game (get it on GOG.com for cheap!) and how engaging the game and the Glorantha setting both are. That's when it kicked in inside my noggin somewhere that one of my favorite local gamers (who I've never gamed with), the incomparable John "Johnny Wheatstraw" "Schultzy" Schultz can never talking about RQ and Glorantha. Hell, thought I, if it's cool enough for Schultzy, it's got to be good enough for me, right? The answer turns out to be an emphatic "hell yes." Now, I'm one of those guys who doesn't like to have too much canon floating around, mucking up the stories I want to tell and making things all "that's like this over here" and "that's like that over there." I really prefer to be the guy saying what's where with the help from my amazing players. So, if I ever want to start playing RQ, I'd need to do so in a way that preserves the feeling of Glorantha (because it's a kickass setting) but that requires little to no knowledge of Glorantha itself. Oh, and it also should feel as much like King of Dragon Pass as possible. That's why my brain was chewing on this morning when it half-dreamed, half-reasoned through the following. Your clan has been vanquished, driven from your lands as you took what few animals and possessions left to you and crossed the perilous mountains. Many of your clansmen died during your exodus and many more have been left worse for the wear, stricken with illness and injury, the number of clansfolk of any significant ability is remarkably few. Emerging from a mountain pass hungry, sick and weakened from weeks of travel, your clan discovers a primeval, untouched wilderness with no sign of your clan's foes or indeed any other human tribes at all. Here, perhaps, amid unfelled trees, untilled trees and unhunted beasts, your clan may find a new home. But first, there's work to do. 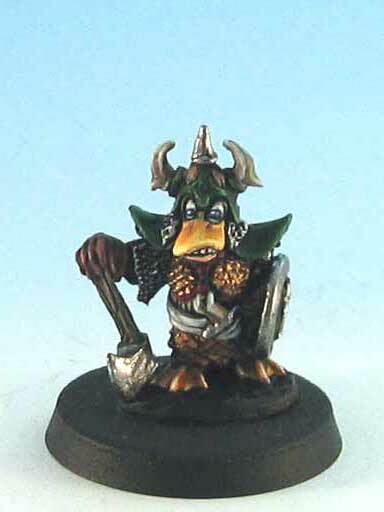 The players will take on the roles of both the community leaders of the clan as well as the small band of remaining huscarls (dedicated fighting and adventuring men and women of the clan). As the clan establishes its new home in the Eden-like wilderness, the players must decide as a group many things. Where shall their settlement be built? Who shall lead? How shall we focus our efforts as we develop our new home? In addition, the players must make some decisions about the mythic history of their clan and what brought them to this wilderness. Who was the foe that drove them from their homes? What were they known for in the homeland? Who is their primary deity (or divine hero)? In effect, how does their old life shape the new life they plan on making for themselves here? I've spent a lot of time lately thinking and talking about ACKS, so the thought of integrating domain management into the early stages of an RPG campaign hasn't been far from my conscious processes. 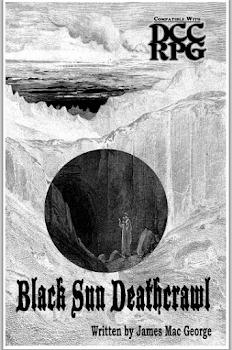 Here, I'd get a chance to play around with some concepts that I'd love to steal from disparate sources like ACKS and Red Tide/An Echo Resounding and mesh them with the stuff from RQII that I really enjoy alongside the parts of Glorantha and King Of Dragon Pass that I found particularly compelling. Are there other human clans out in the wilderness? Ducks? Broo? Dragonmen? Well, probably there are at least Broo, but who knows what else is out there? Certainly not the unsuspecting players who would have to decide how best to set about rebuilding their civilization and prioritize defense, exploration, exploitation and even preservation of this new Eden. As the players make these choices, the mythology of their clan will evolve to reflect their deeds and priorities. These heroes of their clan will endeavor to define a new epoch in the clan's history and will write new myths that keep time with the pulse of their people.